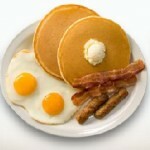 This looks like the typical breakfast you might have out at your favorite diner right? Well let’s get something straight and that is this is extremely unhealthy for you. First off we’re dealing mostly with caged chickens who lay eggs that are not free-range farm fresh eggs which is a huge difference. Those eggs contains more protein and vitamins since the chickens are free to roam around. You can see a previous blog post where I talked a lot about this topic. But for now let me stay focused. Bacon and sausages I’m sure you guess are not good for you. Not only is it high in grease but it’s extremely high in salt content. Did you know that foods that are high in salts retain considerable fluids and worsen edema. This will increase weight gain quickly. One of the other things to watch that does this is alcohol. Sorry, but I had to be honest there. Now onto the dreaded pancakes. To be honest I think these are the worst of the worst in this meal. Why is this? Well first off you’re loading your body with flour which is a huge weight gainer as well as drenching on that sweet syrup which is loaded with sugar. I’m sure I don’t need to expand much further on this. Oh yeah, not to mention the pad of butter they put on the top of the pancakes. Yikes! So now that you know what not to eat let’s talk about what you should eat to get a healthy balanced meal in you to start the day. 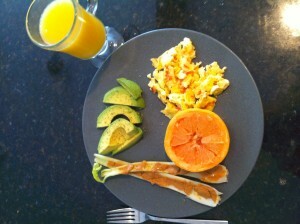 Take a look at an actual meal I cook for breakfast just about every day. Whoops! Well excuse the sideways pic…this thing is not formatting correctly. But you see what it is anyways which is the important part. First off natural organic orange juice which I’m sure you know is high in Vitamin-C and helps boost your immune system. Second we have cage-free farm fresh organic eggs which are the healthiest that you can eat and extremely high in protein. Also you can get these in your local grocery store. What I add to the eggs is tomatoes which are a fruit (yes it’s a fruit – it has seeds) that is also high in Vitamin C and Vitamin A. Also they help reduce certain forms of cancer. Additionally, I add sweet onions like vidalias or sometimes I mix it up and saute some red onions to give an extra kick. These also have some great little benefits like protecting you from coughs and colds but also major benefits like preventing cancer or cardiovascular health. Next we have the peanut butter and celery which I just wrote a blog post on maybe about a week ago. So check that out for more benefits but it’s high in protein and high in fiber. Also the same with avocado’s. Feel free to go back and check out those posts. You’ll get some great insights on how beneficial these are. And one of my little desserts to eat at the end of this meal is a nice Grapefruit and preferably “Ruby Red” if they have them in season. Another great source of Vitamin-C. So I’m sure you can see that if you’re trying to cut down the unwanted pounds or just even start living a more healthy, energetic life then you can start with your first meal of the day: Breakfast. As you can see by comparison these two meals are drastically different in health benefits and even calories. Another great trick is to make whey protein shakes. Did you know that whey actually is the highest form of protein and because it is it will keep you from grazing through the pantry throughout the day. Here’s a great article on whey protein shakes I wrote to get some recipes that are absolutely delicious for you to try.